During a recent visit to the 2nd Swing Minnetonka store location, I was in the hitting nets hitting some irons shots. By the way, in case any of you think I go to 2nd Swing too much, just remember who I write for– and it’s better to be hanging out at a golf shop than plenty of other places. Although the “Norm!” from Cheers reference gets a little obvious for the general shopper, I always enjoy my visits and looking at the new and traded equipment. General Manager Scott Johnson sauntered over and mentioned that he had something “right up my alley”. A few moments later he produced the new Adams CMB irons. With C-Taper KBS shafts, cool grips, stiff shaft and a 4-Gap iron arrangement. “Try these,” he devilishly grinned. Knowing full well what would happen next. Once I was able to get my drooling over these irons under control, I set about to making a few passes at some balls and seeing how they felt. So when you add some stronger lofts to the irons and then combine it with the KBS C-Taper shafts, the result is a slightly lower than normal ball flight with longer carry. But, it looked like I was keeping my roll distance down to a reasonable number. It took me about two days to pull the trigger and use up the rest of my trade credits, plus trade my old set of irons, a couple wedges, and a fairway wood I no longer use to make the deal. I rushed down to Halla Greens (Chanhassen on Pioneer Trail…a top range nominee from yours truly) to give them a try. Once outside, I was pleasantly surprised to find the distances gained from the indoor simulator held up. I normally hit my 9-iron about 135 yds. With the CMB, I was around 145-150 yards. The divots created were shallow but acceptable (I tend to be a sweeper of the ball). I lost about 10 yards on my mis-hits, but it did not feel that poorly. I’m torn on that sensation. For me, the real test comes when hitting the longer irons. The distance gains I experienced carried over with the longer irons. The 6-iron carried a solid 175-180, the 5-iron was 185-190, and the 4-iron? 195-200 yards on average and I did not have to swing hard at all. In fact, the easier I swung the 4-iron, the further it travelled. I liked the feel and consistency of the 4-iron so much, I pulled my Adams 4 hybrid out and put the 4-iron in the bag!! Tell me the last time that happened. The final tests happened last weekend. Golf on Friday, Saturday morning, Sunday afternoon practice, and 36 holes of golf on Monday. I experienced some distance issues. Like remembering I do not need to swing hard to hit it 150 yards with the wind (that should be the same all the time, by the way). I hit a few shots over the greens. Some miss-hits did not reach the green like I had wished and I had one or two pulled shots. Those are more related to the operator (me) than the equipment. If I have one small complaint, it would be the feel around the greens when chipping or pitching. The stiffness of the shaft and the shaft tip do not lend to providing me with adequate feedback on how the shot feels vs. how it turns out. That will require some extra time to develop the necessary “feel” I’ll need to be able to accurately gauge how much to put into certain chips and pitches around the green. Adams has outdone themselves, yet again. 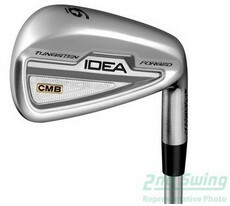 I played their Idea Pro irons a few years back and was impressed with the effort they put forth. With the CMB irons, Adams has raised the bar yet again. I was using a set of Taylor Made Tour Preferred irons but I needed to add quite a few strips of lead tape to reach the swingweight and feel of the CMB irons. No adjustments needed. Standard length with standard grips. While I wish the club heads and shafts would offer me some better feedback around the greens, I just love the distance, accuracy, and solid feel of the irons when hit properly. Taylor Made recently purchased Adams Golf. Here’s hoping they leave them alone and maybe learn a thing or two about how irons are made. What irons are you playing? What do you like about them?